There are some flavour combinations that I will never tire of and one of those is combining sweet and savoury together. 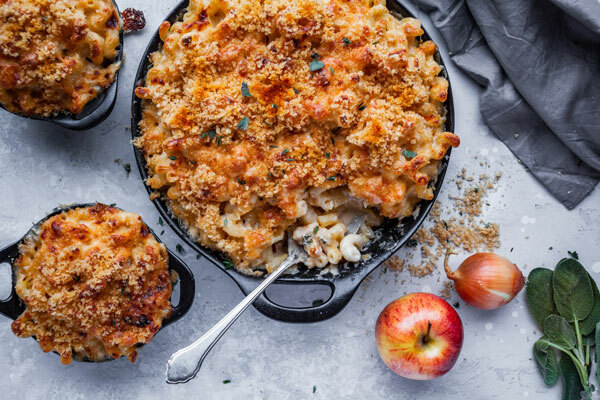 One of the best ways of doing that is combining cheese with something sweet. Cheese and honey, cheese and jams and most definitely cheese and fruit. 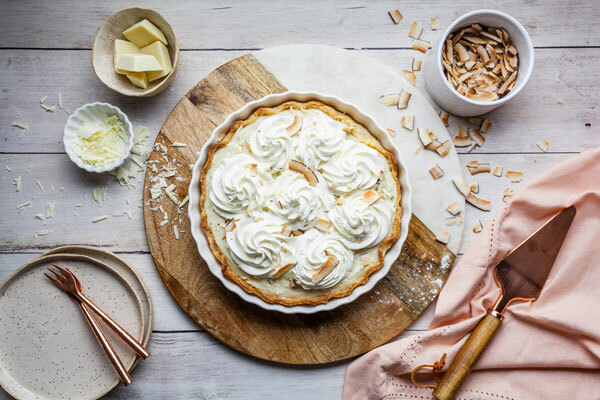 Making this pie with a cheddar cheese crust was a no brainer for me because of the love of all things sweet and savory. The perfectly sweet and syrupy apples are all stacked over and hugged by a flaky buttery and slightly savoury crust. Unbelievably delicious, but believe it! It really happened and is a very good idea. Not a new concept by any means when it comes to apple pie but whoever came up with it was totally a genius! The topper is literally the topping. 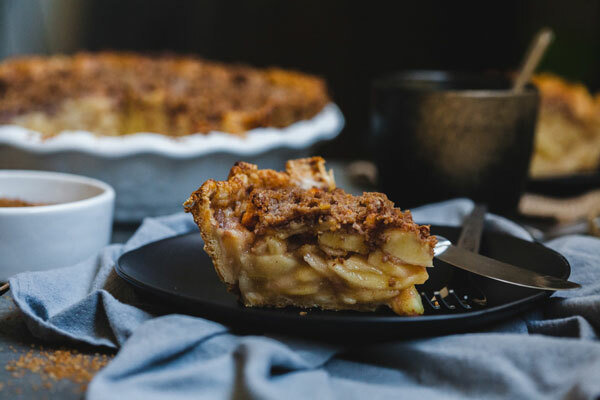 What makes it a Dutch Apple pie is that instead of doing the top layer using the crust you top the pie with a crumble or streusel topping for extra crunch and texture and it works so well. The recipe for the crust makes two, one for the bottom layer and one for the top so feel free to use that instead if you’re not a fan of a crumble. I saved the other pie crust for an apple tarte tatin I was making, but it keeps well in the freezer and would also be perfect as a topper for a pot pie, a galette, hand pies or if you dare make this beauty again. 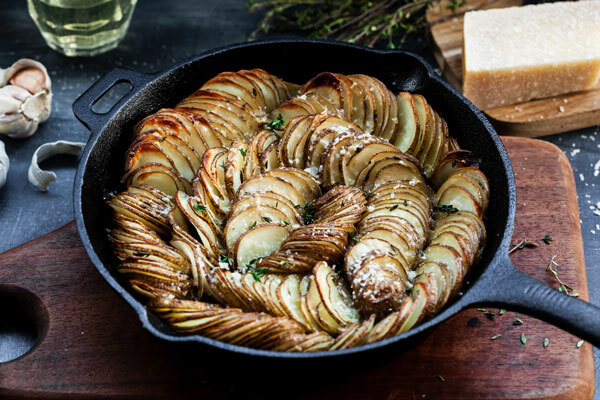 It’s versatile and delicious and you will wonder why you never made all your pie crusts with the addition of cheese! Do you taste the cheese? Yes and no, that’s not the first thing you taste in the crust. The cheese gives the crust extra fat (always a good thing in a pie crust) which makes it extra tender and flaky, and gives its a savoury hint of flavour that if you didn’t know there was cheese in it, you would wonder what it was that tastes different. 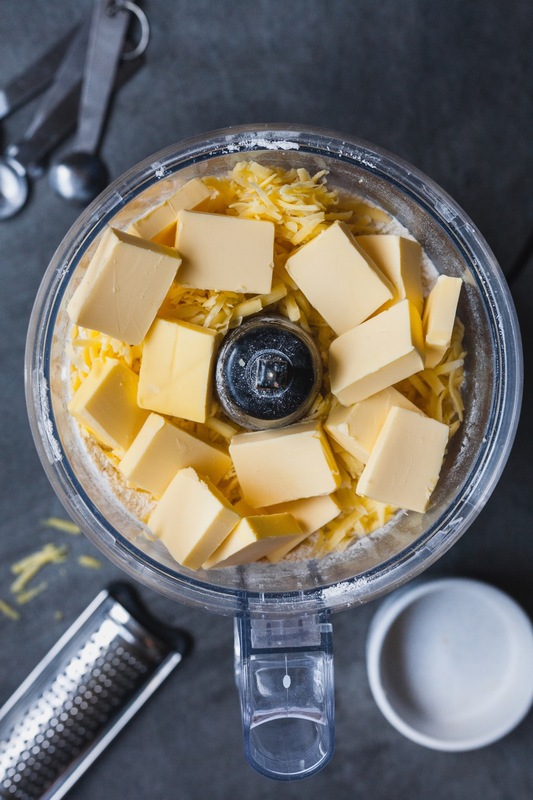 It’s very buttery, with a hint of saltiness, and a hint of nuttiness, totally making cheese the perfect addition to your pie crust whether your baking up something sweet or savoury in it. The streusel topping is sweet and crunchy and has a nice crisp chewiness from the addition of chopped nuts. It’s a tasty blanket covering the layers of apples. It’s wonderful when served and topped with ice cream. 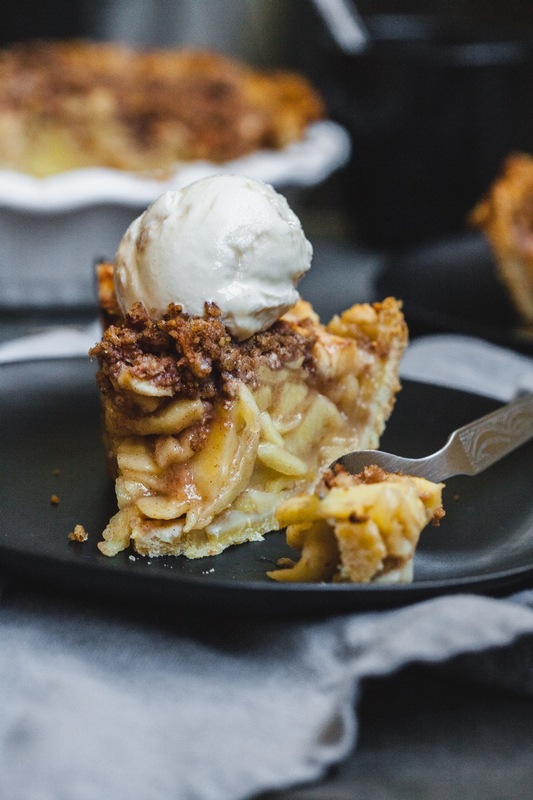 The ice cream starts to melt a bit and seep into the streusel making every bite such a treat. Let’s talk about the layered apples. I did my research a bit when it comes to the apple filling and how much juice/syrup from the apples is acceptable in order to get a good balance but also so that the filling doesn’t make the bottom of the pie soggy. I also didn’t want to make this recipe overly complicated but as simple and quick as possible so I didn’t want to have to wait for the apples to release their natural juices and then have to reduce them on the stove top to make a syrup and etc….. that is why I took Ashley’s advice from Baker by Nature and allowed the apples to marry for a little bit with sugar and lemon juice and then discard the juice they produce which is actually not as much as I thought. 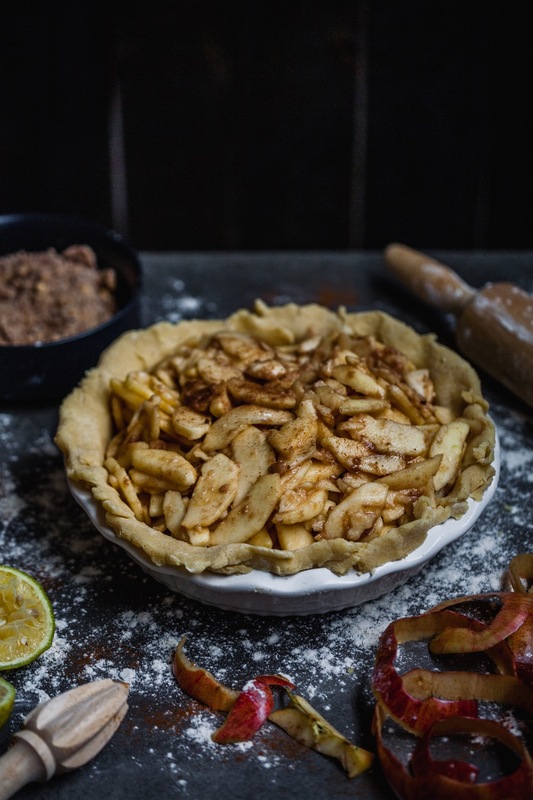 The second thing is to sprinkle the base of the pie crust with a sugar and flour mixture to help prevent a soggy crust because the apples will still produce a lot of natural syrupy juices while baking. 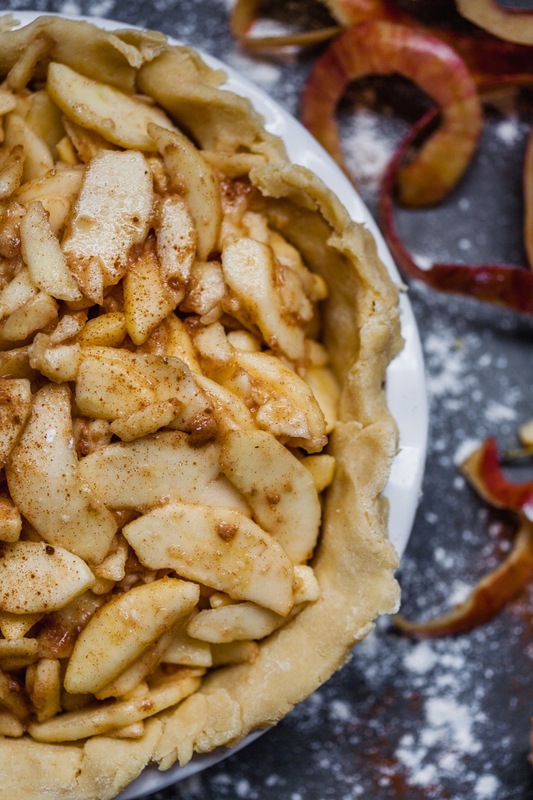 There is a fine balance because you want your apples syrupy but you dont want a soggy crust. Those little tips really help along with baking at a high temperature for the first part of the baking process to ensure that the bottom crust really crisps up. I bake my apple pie on a baking sheet so it picks up any bubbly messes while the pie is baking and so when it comes to an apple pie with lots of filling, I place my baking sheet in the oven while it is preheating so that it’s nice and hot and accelerates the baking process a bit. 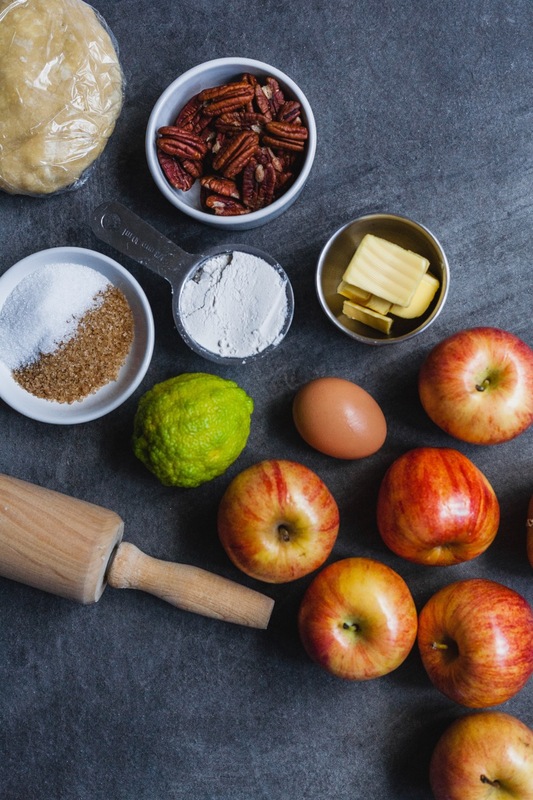 Hope those little tips help you make a very delicious and simple apple pie. There’s a few steps involved in making this and any really delicious pie but it’s totally worth it. I don’t mind a pie with a few step or any recipe with a few steps for that matter, as long as I can make a few of those steps easier by making some of the components in advance. You can definitely do that with this recipe. I made the crust the week before and stored it wrapped tight with plastic wrap and then a layer of foil in the freezer. I thaw it out in the fridge the night before I plan to use it. It can be stored in the freezer for at least 4 weeks. I also made the streusel topping a few nights before and stored it in an airtight container in the fridge. This makes pie prep and baking so much easier and you have everything on hand when you’re ready to make the pie. You can even make the whole thing in advance and freeze it unbaked. To freeze an unbaked pie, wrap pie tightly or place in a plastic freezer bag (as you would a baked pie). 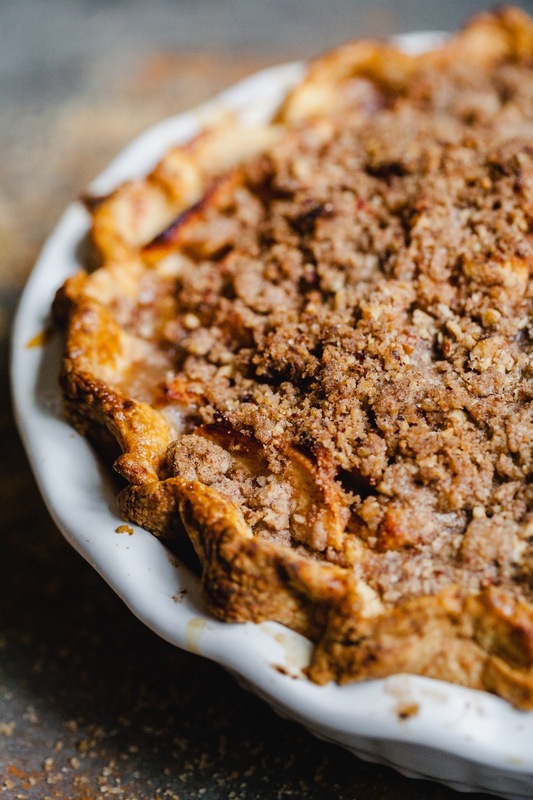 Don’t cut slits in the top crust if you’re using a regular pie crust topping. Unbaked fruit pies will keep in the freezer up to 3 months. When you’re ready to bake, unwrap and carefully cut slits in the still-frozen top crust of using. Do not thaw. Bake at 425°F for 15 minutes. 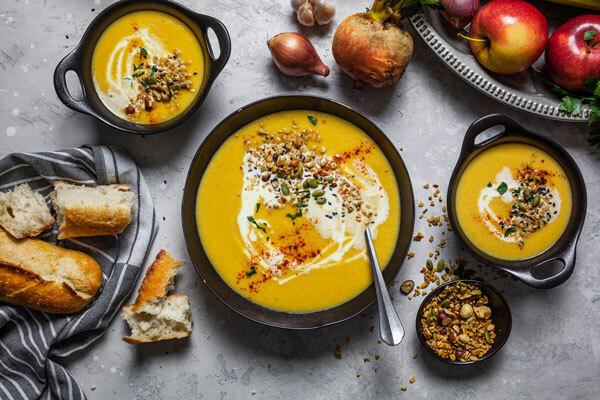 Reduce heat to 375°F and bake 30 to 45 minutes longer or until crust is golden brown and juice begins to bubble through the slits or through crumble. Make sure to tent pie with foil with vents cut into it if the crust or streusel starts to get too brown like mine did. I don’t mind mine dark and crunchy though so it’s up to your preference. 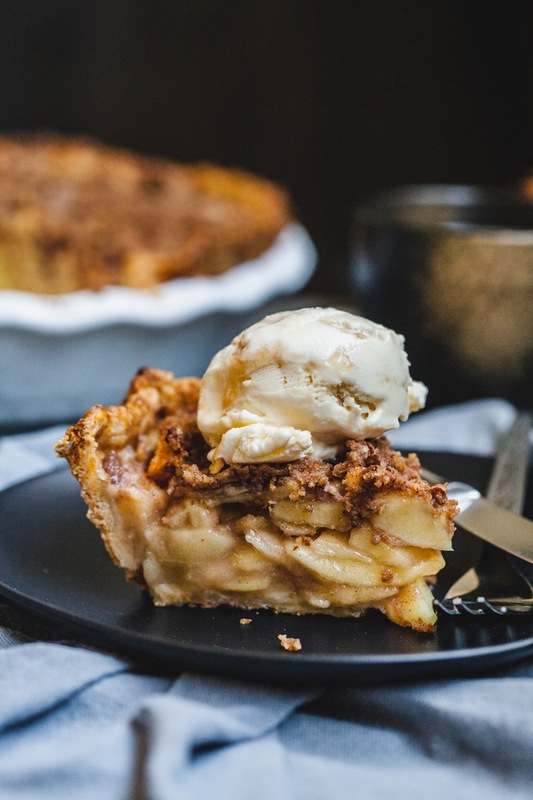 You and your family will love this apple pie and it’s definitely a keeper especially if you want a little twist to a regular apple pie. If you don’t want to use cheese in your pie crust and just want a regular pie crust just click here for my go to buttery and delicious pie crust. 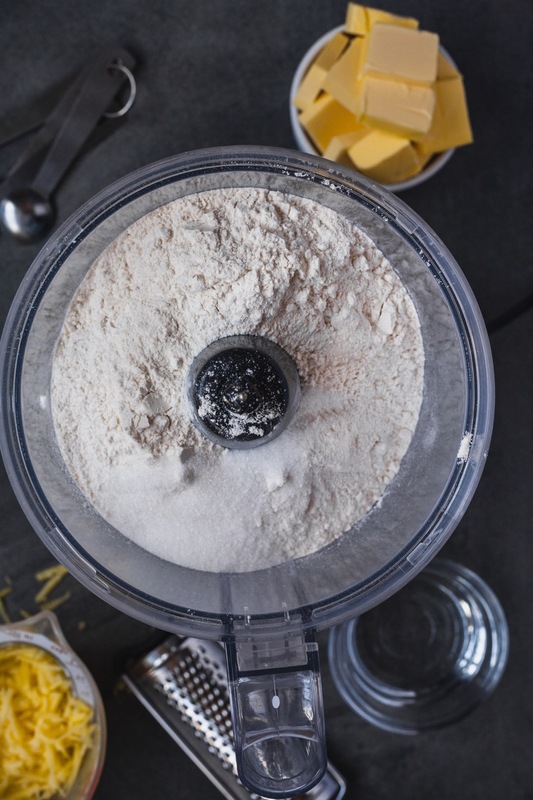 In a food processor, briefly pulse flour, sugar, and salt. Add butter and cheddar; pulse until mixture resembles coarse meal with a few pea-size pieces of butter remaining. Sprinkle with ¼ cup ice water. Pulse until dough is crumbly but holds together when squeezed (if necessary, add up to ¼ cup more water, 1 tablespoon at a time). Don’t overmix. Turn out dough onto a floured surface and divide dough (one portion should be slightly larger than the other). Shape each portion into a disk. In a food processor fitted with the metal blade, pulse together the sugars, nuts, and cinnamon until the nuts are coarsely chopped. Add the flour, butter, vanilla, and salt and pulse until the mixture is coarse and crumbly. Empty it into a small bowl and, with your fingertips, lightly pinch it together to form clumps about ½ inch in size. Store at room temperature, up to 1 day; refrigerated, up to 1 week; frozen, up to 3 months. Allow it to come to room temperature before using. 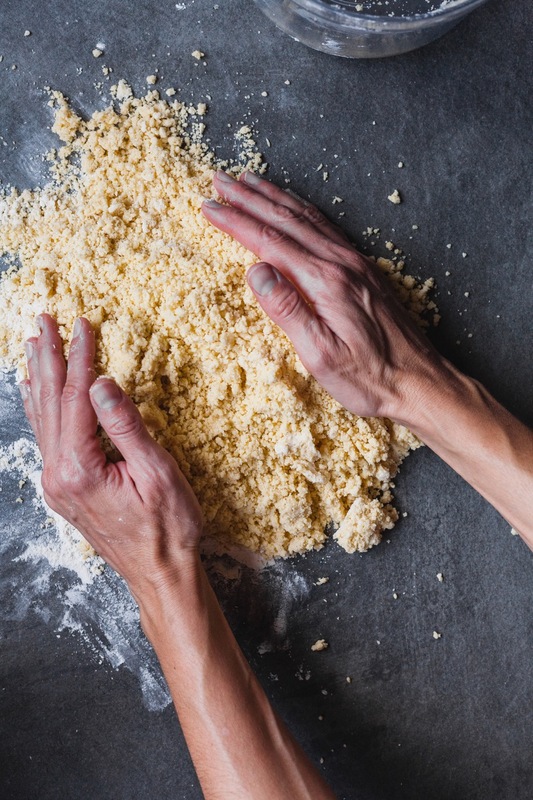 A high oven temperature is needed to also set the streusel and keep it from being greasy. The streusel bakes in 15 to 20 minutes, at which point it is golden brown; longer, and it will become bitter. It is, therefore, best to either add it during the last 15 to 20 minutes of baking or make sure to tent with foil after its has turned golden brown like I usually do. 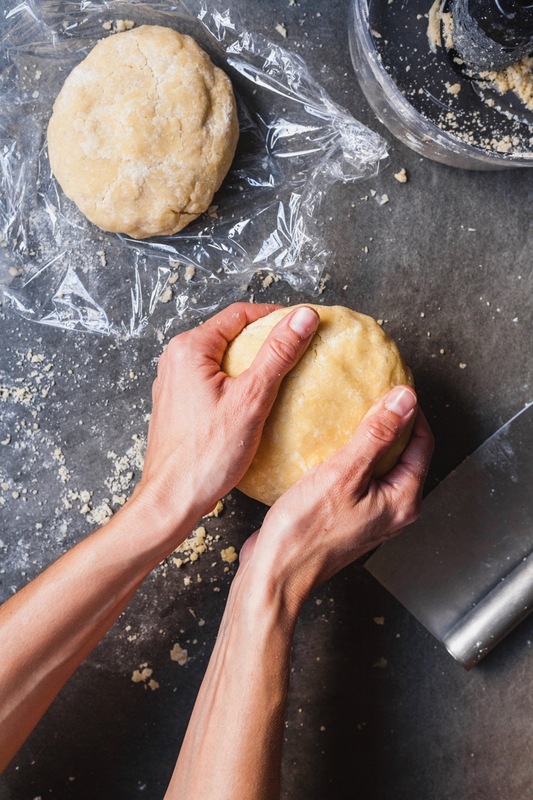 On a lightly floured work surface, roll out the disk of dough just under ¼ inch thick on a lightly floured surface and fit into a 9-inch pie plate. Trim overhanging edge of pastry 1 inch from rim of pie plate. Fold and roll pastry under, even with plate; trim and fold as desired. 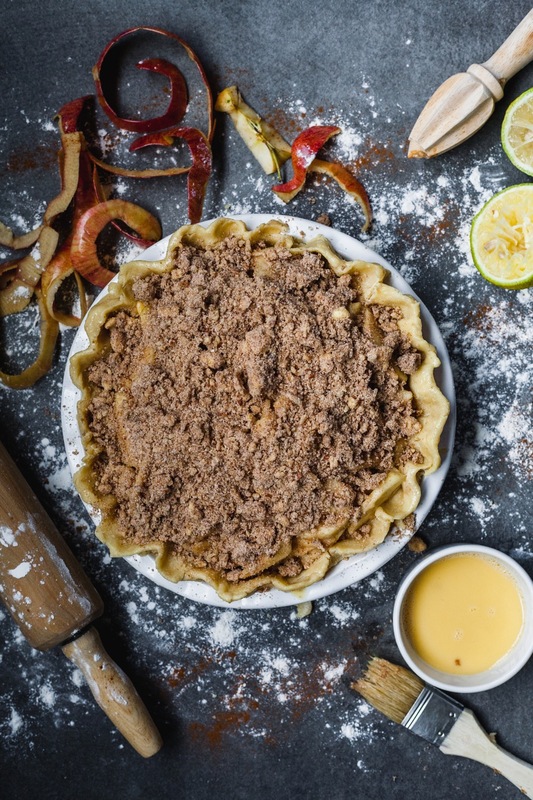 Brush the folded edges of crust with egg wash.
Sprinkle the bottom of the pie shell with 1 teaspoon of flour and 1 teaspoon of granulated sugar (this helps soak up excess moisture)and refrigerate while you make the filling. In a separate large bowl, combine the light brown sugar, cinnamon, allspice, nutmeg, black pepper, salt, and flour. Use a slotted spoon to add the sliced apples into the sugar-spice mixture, leaving excess liquid behind. Gently toss the apples in the sugar-spice mixture until they’re evenly coated. 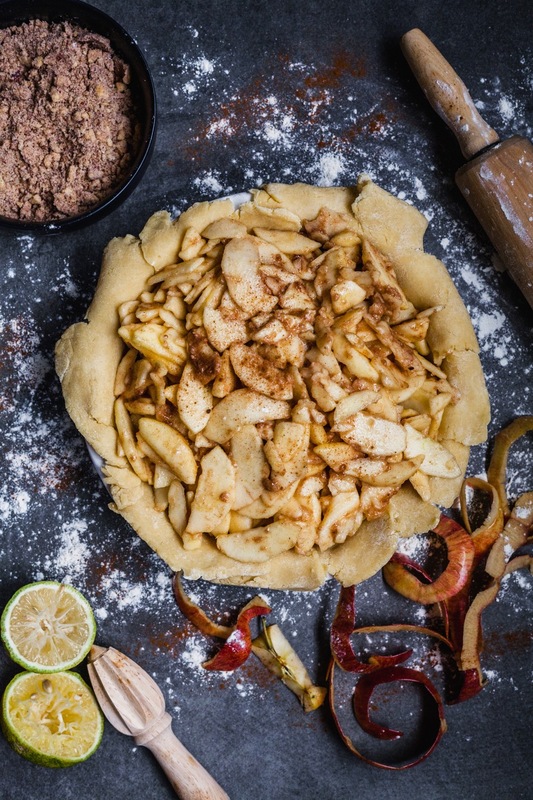 Remove pie crust from fridge and pour the apple and spice mixture into pie plate, mounding apples toward center. 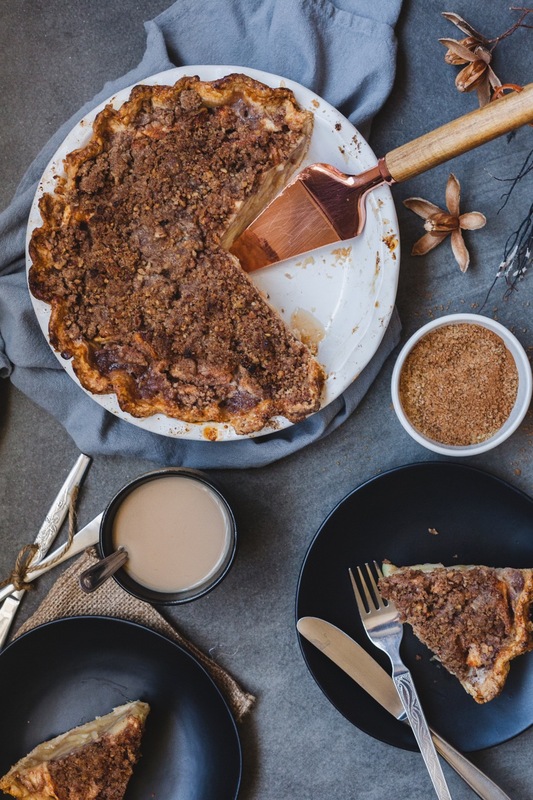 Sprinkle streusel evenly over top of pie. 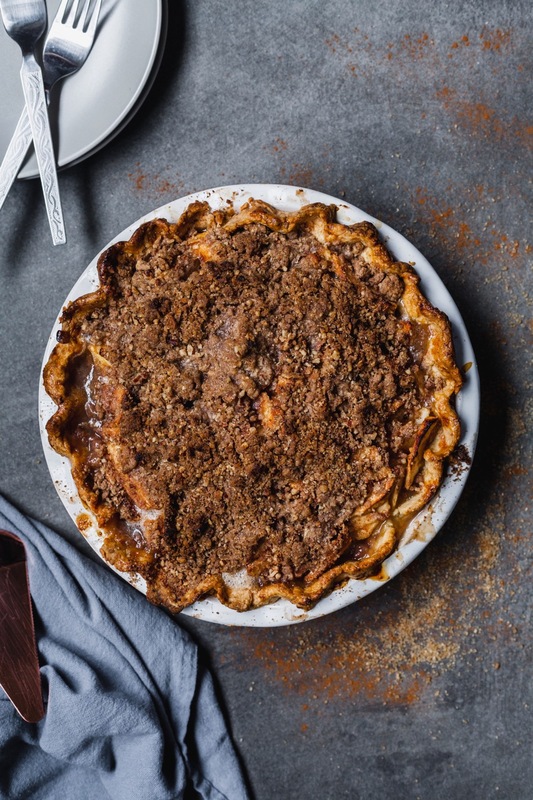 Place the pie on parchment lined baking sheet and bake for 20 minutes then reduce temperature to 400°F and continue to bake for another 45 - 55 minutes or until pie crust and crumb topping are deep golden brown and filling begins to bubble. If pie topping and edges are starting to brown too quickly tent the pie with a sheet of foil with a few vents cut into it. Transfer to cooling rack to cool for 3-4 hours. Serve warm or cold and store refrigerated.